Great watch. Reminds me of steampunk sort of with the two dials in the face. It is easy to adjust and looks great on my wrist. It keeps perfect time! This charming timepiece from Akribos XXIV features a mother of pearl dial with an AM/PM indicator. Powered by Swiss quartz chronograph movement, the dial displays 60 seconds and 30 minute timers. A leather strap completes the glamorous look of this watch. 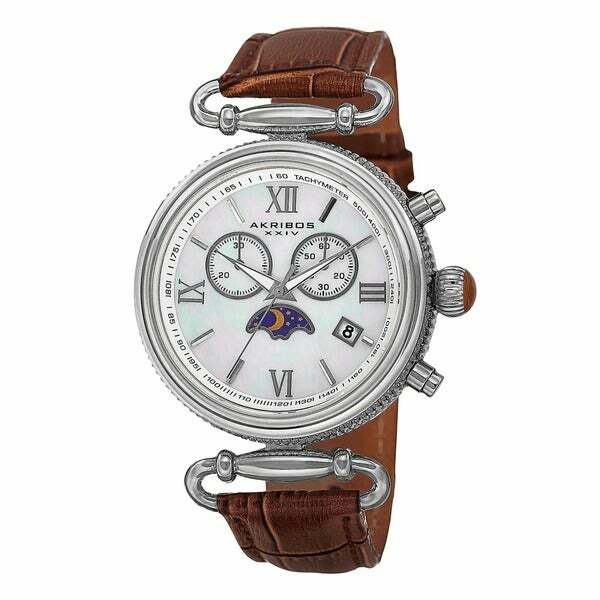 Stay trendy and punctual with this chic women's watch adorned with silvertone Roman numerals and luminescent hands. The dial on this timepiece is covered by a mineral crystal with a sapphire coating for extra protection and clarity. A push/pull crown makes setting the time a breeze, and a handy tang buckle keeps the piece secure on your wrist. I love this watch and wore it for the first time at at a work conference at the Lodge of the Four Seasons in the Ozarks. As i was checking in, the desk clerk was the first to notice and compliment it. I had on jeans and Old Navy sweater. It was very cute. The next day I decided to dress it up with slacks, white shirt and scarf. Because of the large face, i wasn't sure i could pull it off but it looked perfect. I received many compliments on it. So i bought it in every color available. I now have the white one witg blue face dials and camel colored band. You can't go wrong with this style and I have a small wrist. If you like a big watch then this is the watch for you! This is a great watch. I love the design. The strap is a little lighter in color than the picture in my opinion but I still loved it. It's very neutral and goes with a lot. Be warned, this is a very large watch, so pay attention to the dimensions. If you have a small or dainty wrist you might want to look for something a bit smaller. I had to return this watch. It’s much bigger than the pictures indicate and the face completely overlapped my wrist leaving the hinges uncomfortably sitting on my bones. "Does quartz mean battery I think it does but wanted to be sure because I know there is also a solar powered too." Yes, quartz does mean battery. This watch is powered by a battery. "Is this a true Moon Phase dial, or just a Day/ Night 24-hr dial?" The moon phase just shows day and night. "I have a 7.5" wrist, will it fit me?" Hello boomerbayb, the strap is approximately 8.5" inches long. It does feature an adjustable buckle so it should be fine. Please let us know if you have additional questions. Thanks for shopping with us. Matches with the buyer's current watch, a gift for a significant other.